Thank you to everyone for contributed to the Souper Bowl! Thanks to everyone who donated to the first annual Souper Bowl! 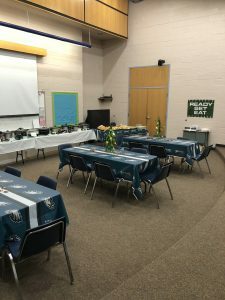 The faculty and staff were extremely grateful and enjoyed the luncheon immensely! The PTO appreciates the time, effort, and culinary skills of everyone involved! The kindergarten teachers would like to thank the parents who were able to help out with Bear Hunt Day in November. We know the children love taking part in this Valley Forge tradition and we would not be able to do it without our parent volunteers. Thank you Lauren Doran, Shannon Korff, Ellen Galka, Heather Manifold, Jenette Oddo, Simmer Marcelli, Claire DeCurtis, Amanda D’Ascanio, Alexis DiLullo, Amy Saylor, Jess Graves, Alex Bradley, Weronika Zwierzchowski, Kim Reeder, Annie Jacob, Brad Osborne, Zack Walker, Kevin Shinal, Rachel Reynolds, Michael Marcelli, and Wendy Higgins. An extra thank you to Amanda Miller and Tracey Quarles for helping with Bear Hunt Day, but also for helping to put up the teepee the night before. We truly appreciate all of you! We look forward to doing it again for Earth Day! Thank you to Mrs. Nation and Ms. Huong for your time, patience and dedication to our children! You have instilled a love of music in their hearts and throughout the halls of VFES! We enjoyed the Winter Concert immensely! Thank you to the Bittenbender Family! Thanks so much to Heather and Fritz Bittenbender for generously sponsoring the “groovy” VFES Winter Staff Luncheon on December 15! In addition to the delicious feast, they thoughtfully sponsored a raffle for a massage, won by Ms. Tornetta. It was a wonderful lunch enjoyed by all, and we are extremely grateful for their generosity! Thanks to the volunteers for the Winter Luncheon! On behalf of VFES, thanks to all of the volunteers who helped make the VFES Winter Staff Luncheon a success! From decor to desserts, we couldn’t have done it without your support! It was a great lunch, thanks to you! Thanks to VFES for your generosity! On behalf of the VFES PTO, thank you so much for your generosity towards the Winter Staff Gifts collection. In addition, thank you to Julie Soura for collecting and compiling each donation! Thanks to Stacy Albert for getting each donation onto a gift card! The PTO would like to thank Doug Wilson for organizing our VFES clubs and for a successful fall semester of clubs. It’s a lot of work, and we TRULY appreciate it! The PTO would like to thank Emily Carteen for organizing the VFES Spirit Wear sale! We appreciate all of your help!! The PTO would like to thank Erika Dawson for all of her hard work as Web Coordinator. We appreciate your support and help!